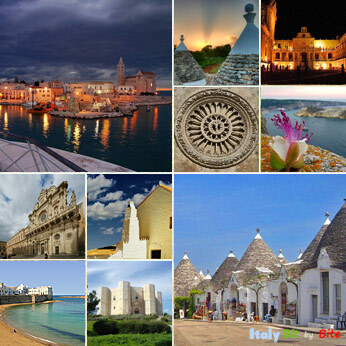 Puglia lies in the extreme south-east part of the Italian peninsula. It extends from the "spur" of the Italian boot (the Gargano Promontory) down to the "heel". 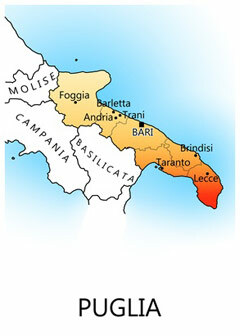 The region's most southern part, Salento, also known as penisola salentina, forms the "heel" of boot-shaped Italy. Not a traditional tourist destinations, Puglia is one of the richest archaeological regions of Italy and is becoming increasingly popular among travellers in search for a slice of unspoiled Italy. The best time to visit Puglia is in either late May, or alternatively March just before Easter, or September into October, when the rush of summer visitors has passed but the sea and air remain very pleasant. In July and August the summer heat may become unbearable and many hotels, shops and restaurants shut down in August. 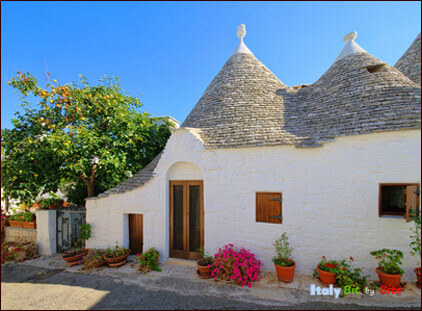 Terra dei Trulli: the region extending between Fassano, Ostuni, Martina Franca and Alberobello where the typical trulli can be found. Valle d'Itria: the road from Locorotondo to Martina Franca follows a vast plain planted with olive trees and vines and scattered with trulli. Santa Maria Al Bagno, located on the coastline of the Gulf of Taranto, is a small fishermen village with beautiful unspoilt beaches all along the coast. With its white-washed towns, trulli, olive groves, Roman ruins, beautiful beaches and excellent cuisine the region has many charms. The region also abounds in prehistoric (dolmens, menhirs) and early historical monuments up until the colonization by the Greeks.